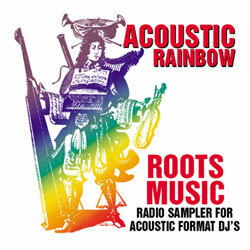 All albums must be reviewed first before getting placed on the Acoustic Rainbow Radio Service. You can NOT just write a check and be distributed to stations. We will review your entire CD, every song, and help you chose the BEST song for radio … often this might not be your “favorite” tune on the album, so don’t get upset! We are here to help you. Send TWO COPIES of your CD to the above address along with a simple letter (no big press kit needed) and make sure your contact information is included. Questions? Comments? Are you a RADIO Station that wants to be on our servicing list?